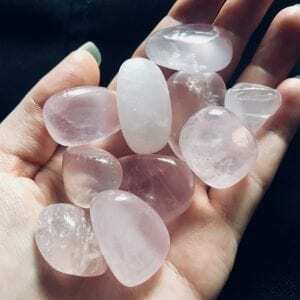 Rose Quartz - A must have for any empath! Rose Quartz is a stone of love, compassion and nurturing making it a must have for any empath. This powerful and high vibrational stone promotes pure love, purifing and opening to the heart to all levels of love, friendship and deep emotional healing. Simply holding Rose Quartz can have a calming effect on the mind, spirit and body. This will allow the holder to feel at peace, leaving them happy and full of joy. With this in mind, Rose Quartz can be an excellent gift for someone who is grieving, allowing the loving energies to dispel the negativity and replace it with all that is loving and comforting. Promoting Independence, Promoting Responsibility, Unconditional Love, Heart Chakra, Love in the Family, Romance, Friendship, Peace, Calming, Positive Self-Affirmations, Nurturing, Heals Emotional Wounds, Balance Emotions, Beauty, Joy and Heart Chakra. Keep out of direct sunlight as sunlight will fade it’s beautiful pink colour. Once your Rose Quartz has been cleansed, recharge it by placing it under the Full Moon or burying it in Earth and then rinsing with Rose Water several times.